ROADTRIP-'62 - Off to the Races! Welcome back to ROADTRIP-‘62 ™ , where once again we discuss things from 1962! My name is Don Milne and I’m your virtual tour guide. This week, I’m going to look at the various races and their venues along US-23. As usual, every other week I discuss some aspect of how our trip relates to 1962, the United States or the world, or even how it relates to today. I try to relate the discussion to the segment of US-23 we just traveled the week before. This should allow those of you not familiar with 1962 the fun of learning, and those of you who lived it the fun of remembering. By the time we travel the entire 1444 miles of US-23, we should all have a pretty good model of just what 1962 was all about! So let’s take a look at the sports pages of our newspapers and magazines and see where the races were. It seems that men have been racing each other ever since someone figured out that getting someplace first garnered big rewards. You might get the best game in a hunt, the best place to live, the best mate, or outrun your enemies. As with everything else, we’ve evolved the basic concept to take advantage of our technological knowledge along the way. Today, we’ll race just about anything that moves! Everything from ourselves, to animals, to any vehicle we can imagine. And a surprising variety of these can be found racing along US-23. Not usually on the highway itself, though that happens too, but in venues in the cities along the way. In previous posts, I’ve already mentioned canoe races, drag and other automobile races, horse races, and even go-kart racing. Let’s see what else we can find. At the far south end of our travels, in Jacksonville, Florida, we will find dog races. We could see races on at least three tracks in 1962 and there are still two open today, St. Johns Greyhound Park, and Orange Park Kennel Club south of town. The Jacksonville Kennel Club, which opened in 1935, is now closed. The site is now part of the local school system but the old signs are still in front of the building. Of course, what kind of race would be complete without gambling on the outcome? Betting was a part of the activity almost from its beginnings in the 19th century. Florida allows betting on the live greyhound races here and on simulcast races from other venues, all from the comfort of the grandstand. Or, for more action, you can watch trackside, right along the rail. 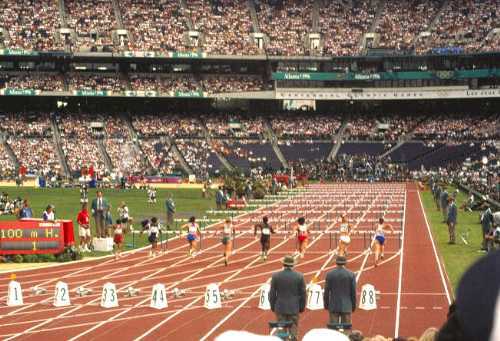 The sport reached its attendance peak in 1992, when with nearly 3.5 million people coming to more than 50 tracks. Since then, revenue has dropped by nearly half. Other forms of legalized gambling, mostly casinos, are largely the cause. There were greyhounds known to be in the United States as early as 1848, briefly mentioned in a book about Oregon and California. In 1878, Major James H. "Hound Dog" Kelly trained a team of four greyhounds that ran down six out of a dozen antelopes. That event is generally credited as the start of American “coursing.” Greyhounds were imported from England to help protect crops from the jackrabbit population, as farms spread west. Racing the dogs became popular throughout the Great Plains and beyond. The English had experimented with the greyhounds chasing an artificial hare instead of a live one back in 1876. But the modern sport got its boost in 1912 with the invention of a mechanical rabbit and an oval course, instead of a straight run. Owen Patrick Smith of Hot Springs, South Dakota felt the sport as practiced in his time was cruel for its use of live rabbits. He went through several designs and funding rounds with George Sawyer, a wealthy greyhound and boxing arena owner, before they had a suitable device to replace the rabbits. The first Florida greyhound track was built in 1922 in Hialeah, Florida, and the key to success turned out to be night racing. Such unusual animal races as frog jumping and pig racing are sometimes found at county fairs and small-town festivals. People also race ostriches and even cows. I was not able to locate any along US-23, but perhaps you know of some. How about people races? Foot races between people are usually categorized by length. Some, such as a 100-yard dash, are very short and fast. At the other end are marathons, a race of 26 miles and 385 yards. Why the odd length? The length was established for the modern Olympic Games. The distance was a nice round 40km in the first modern Olympics in 1896. But the various concerns of useable roadways, stadium constraints and ensuring the Royal Family could have a good view meant that the 1908 Olympic Games ended up with a length of 42.195 km (26 miles 385 yards). The length was modified in each of the next few Olympics but was finally fixed at this same length in 1921 by the International Amateur Athletic Federation (IAAF). You may be familiar with marathons in the Olympics, as the event continues to this day, and also with the Boston Marathon. This race is 115 years old, and other than the Olympic Games, it's the oldest continuously run marathon race in the world. The winner in 1962 was Eino “The Ox’’ Oksanen of Finland, with a time of 2hours, 23 minutes, 48 seconds. He was last of a group of Finns who won six victories in an eight-year span. While none of the marathons held along US-23 are that old, at least two will qualify you to enter the Boston Marathon. Toledo, Ohio’s “Glass City Marathon” began in 1976 and is a certified race course that can serve as a qualifier for the Boston Marathon. At the end of our route, Jacksonville, Florida’s “Jacksonville Bank Marathon” also qualifies you for the Boston Marathon, for not one but the next two years. This race began only in 2006. In fact, none of the marathons held along US-23 were around back in 1962. The oldest is Atlanta, Georgia’s “Atlanta Marathon.” It began in 1963 at the North Fulton Golf Course. The following year, the Atlanta Track Club was formed, and has run the event ever since. It is also the only U.S. marathon run on an Olympic course. Almost 90% of the course is the same as used in the 1996 Atlanta Games. Runners even pass under the Olympic Rings on their way to the finish line! Shorter foot races also attract a lot of attention, and make for higher speeds. Jim Beatty of Los Angeles became the first person to run an indoor mile in less than four minutes, setting his record on February 10, 1962. Jim also set a record for two miles this year. The old idea of the four-minute mile was broken all around the world this year on outdoor tracks. In one of the shortest of the standard foot races, Robert Hayes of Florida equaled but did not break the 100-yard dash record of 9.2 seconds set in 1961 by Frank Budd. Another way we humans race is with a personally powered vehicle: the bicycle. There are several bicycle races up and down the route, with some using US-23 itself. One thing to note about bicycle races, although the sport is very old in Europe, we probably would not have seen a race in the United States back in 1962. Today, we can see several along our route. Das Tour of Frankenmuth is a loop through the farm country near US-23 and Frankenmuth, Michigan. At Milan, Michigan, the Cone-Azalia Classic takes place on gravel and dirt roads just off of old US-23. A weekend of races in the Flint and Fenton, Michigan area is comprised of the Maillot Jaune Bicycle Road Race and Le Champion Pave Criterium. The first features a challenging rural road course and the second includes racing on brick pavement in downtown Flint. Since 1969 the Maumee Valley Wheelmen have been racing in the Toledo, Ohio area. They appear to be one of the oldest organized groups along our route, and have some type of bicycle race about every week during the snow-free months. Further south, the Tri Cities Road Club is one of the oldest bicycling clubs in Tennessee, founded in the early 1980s in the Johnson City/Kingsport/Bristol area. They have sponsored many bicycle races over the years and continue to do so. In 2011, their Omnium will move to Johnson City, where we can see some of the race downtown on old US-23. The Roan Groan portion of the series will finish at the Rhododendron Gardens at the very top of Roan Mountain, with some very steep sections before reaching the finish line. The Asheville Bicycle Racing Club promotes amateur bicycle racing in western North Carolina. Founded in 1984, they also host one of the most competitive omniums in the Southeast, The French Broad Cycling Classic. The Tour de Georgia race was widely considered a warm-up event for the annual Tour de France. This race was canceled in 2009 and 2010 because no primary sponsor could be found to cover the up-front costs of nearly $1 million. Biking great Lance Armstrong won this race in 2004 and competed again in 2005. Since its beginning in 2003, the Tour de Georgia was one of the three events in North America ranked as an Hors Classe stage race event, a world-class, top-ranked stage race. The final stage of the race ended in Atlanta, Georgia. Near the end of our route, the ProGold Macon Cycling Classic Criterium takes place in Macon, Georgia, and we find VeloBrew, a competitive cycling club based in Jacksonville, Florida that started in the summer of 2001. These races are all road bicycle racing; there are other types including mountain bike racing and track cycling. You might have noticed that all of these races are newer than our 1962 vantage point. However, bicycle racing is a very old sport. Road bicycle racing began as an organized sport in 1868 and cycling has been part of the modern Olympic Games since the first games in 1896. 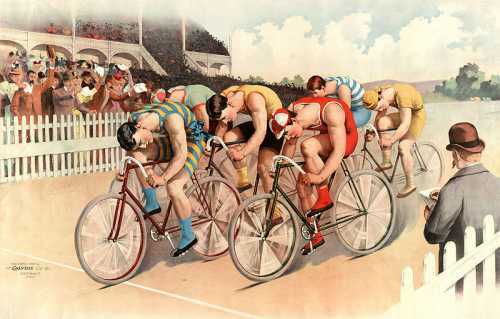 Some of Europe's biggest events are bicycle races such as the Liège–Bastogne–Liège, the Paris–Roubaix, the Tour de France (first held in 1903), and the Ronde van Vlaanderen. The 1962 Tour de France was won by Jacques Anquetil, his third victory in this race. These older events have provided a template for other races around the world. There are two types of bicycle races, the single day race and the stage race. Stage races consist of several races, called stages, ridden consecutively. The rider with the lowest total time is declared the overall winner. There is also a longer version of a single day race, the ultra marathon, which is a single race run over a much longer distance, usually lasting several days. One of the best-known ultra marathons is the Race Across America. This is a coast-to-coast non-stop race, where riders cover approximately 3,000 miles in about a week. The route of the Race Across America crosses US-23 at Chillicothe, Ohio. The race begins in Oceanside, California and ends in Annapolis, Maryland. The concept of a bicycle race across America can be traced back to George Nellis, who crossed the USA in 1887 on a high-wheel bicycle. He made the crossing in just under 80 days. Over the years, no real race was held but about every ten years, the cross-country time record would be reduced by a few days. In the 1970s, John Marino decided to find out how fast a bicycle could be ridden across the United States and modern trans-national cycling competition began. Other riders started challenging the times set by Marino, and in 1982 one group held a head-to-head race. In its first year, the Race Across America was called the Great American Bike Race and consisted of only four riders. They lined up on the pier in Santa Monica, California and raced to New York City. The race has been run every year since, always west to east. Though not really a race, the Tour of The Scioto River Valley is probably the oldest bicycle event along US-23. This year marks the 50th annual ride of the ride, which began as a father-and-son outing in 1962. It has been credited as the inspiration for classic full-service tours across the nation. The route is from downtown Columbus, Ohio to Portsmouth, Ohio, with an overnight stay and return the next day. Portsmouth honors the event with a painting on the Flood Wall Mural along Front St. It’s quite a ride too: you cycle about 105 miles each day! Some portions are right down US-23. Unfortunately, bicycling on the highways can be dangerous. In 2008, a bicyclist in the Tour of the Scioto Valley was killed when he was hit from behind by a vehicle. This occurred on the stretch of US-23 just south of Piketon, Ohio. Though he is listed as being in the ride, investigators say the victim, William Crowley of Michigan, was riding alone and was off the "official" tour route at the time. So, be careful if you decide to bike part of US-23! Of course, people are never limited to a single event, so we have combined a foot race, a bicycle race, and a swimming race into the modern triathlon. The Island Lake Recreation Area, on US-23 at Brighton, Michigan, hosts one of Michigan’s premier sprint triathlons. This is a classic Olympic distance race consisting of 0.9 mile swim, 24.8 mile bike, and 6.2 mile run. The triathlon is a truly modern event, having been conceived in 1974, so of course we couldn’t have seen one back in 1962. As for straight swim races, 44 new world records were set in 1962. Half of these records were swum by United States swimmers, with some in indoor and some in outdoor meets. People also compete in many other races without vehicles: roller skating, ice skating, cross-country skiing, and downhill skiing. Having grown up in the 1960s, my main memory of downhill skiing is watching the Winter Olympic Games. Even though I would only have seen two games, because they are held only every four years, the skiing events made an impression on me. And the impression included a connection with ABC's Wide World of Sports, because that show and the 1964 Olympic coverage used many of the same on-air staff. Today, you can watch almost any type of race or other sport live on TV. With 24-hour sports channels such as ESPN and specialized channels devoted to golf, baseball, NASCAR racing, and more, you don’t need to wait for news to report results and highlights. But in 1962, none of that live coverage existed. Just about the only source for live sports coverage was ABC’s Wide World of Sports. Another race showing off human power is speed skating. In 1962, the men’s world championship went to Viktor Kosichkin of the Soviet Union. Viktor did not win a single race that year but scored enough points overall in events to come out on top. Inga Voronina, also of the Soviet Union, won the women’s world championship. Cross-country skiing is now a recreational sport, but was also seldom seen in the United States back in 1962. Downhill skiing was growing in popularity though, with new resorts constructed all throughout Europe’s Alps and the American west. Austria dominated international skiing, winning the championships in giant slalom, downhill race, and the combined titles. Speedboat racing was a fairly new sport in 1962: sailboat racing had been going on for decades. The leading organizer of the sport in Europe was Sir Max Ait-ken of England. He sponsored a race from Cowes, England to Torquay, France in 1961, which would become the most prestigious speedboat race in the world. This was a sport of pure speed, and attracted an assortment of ex-fighter pilots, professional roughnecks, race car drivers, and other who didn’t fit into the upper crust world of sailboat racing. In 1962, we could have traveled south from the end of our trip at Jacksonville, Florida to watch a speedboat race across the ocean. Don Aronow, a relative novice at sea, finished a surprising fourth in the Miami-Nassau ocean race in a speedboat powered by two custom Chevy 409 engines. In these early years, you could almost slap a number on the side of any boat and enter a race. By 1969, Aronow was winning the Miami-Nassau at record speeds in customized boats and the sport had grown up. Yachting, as professional sailboat racing is known, had several exciting events in 1962. The America’s Cup winner was Weatherly, sailed by Emil Mosbacher, Jr., beating the Australian contender four races to one. The boat survives today as one of only three surviving wooden America's Cup Defenders in the world. The Miami-Nassau Cup Race, another sailboat race, was won in 1962 by Paper Tiger, captained by Jack W. Powell. Powell had also won in 1961. And back at Mackinac Island, near the start of US-23, the Port Huron-Mackinac race was won by Clare Jacobs in the Falcon II. This popular race attracted over 100 yachts this year! Some forms of racing didn’t exist in 1962 because the vehicles hadn’t yet been invented or popularized. Personal watercraft were experimental in the early 1960s, with probably the first one built by England’s Vincent Motor Cycle Company in 1955. The models we are familiar with did not come onto the market until the late 1960s. Similarly, the personal snowmobile only appeared around 1956 in Minnesota, even though larger cargo snow vehicles had been built for decades before. The early personal snowmobiles were heavy and slow, and it was only in 1960, when engines became lighter and smaller, that the modern snowmobile appeared. It would take awhile longer to begin seriously racing these types of vehicles. Another race that is not so old is the Iditarod, a dog sled race held in Alaska since 1973. However, John Baker, who was born 1962, won the 2011 Iditarod! It turns out that motorcycle racing in 1962 has a special link to US-23. The American motorcycle racing circuit crowned a new champion that year in Bart Markel of Flint, Michigan, a city we passed through. He was in a speed duel the entire season against the reigning and four-time champion, Carroll Resweber. There were 14 races in the national championship circuit that year, with one also staged on our route in Columbus, Ohio. Bart won that race and five others, and collected enough points overall to bring him and his Harley-Davidson motorcycle to the top. I had mentioned that we could see harness racing at Scioto Downs in Columbus, Ohio on our 1962 trip. In harness racing, the rider sits on a cart known as a sulky, instead of mounting the horse. Harness racing was in a growth spurt in 1962, growing up from its earlier appearance at county fairs. Over 16 million people attended these races this year, with all the big money action in New York state. The horse of the year was Su Mac Lad, coming back from a slight injury the previous. In other horse racing with just the horse and jockey, the 1962 Kentucky Derby winner was Decidedly, with jockey William Hartack. Decidedly was the son of the 1954 Kentucky Derby winner, Determine. The other two races of the Triple Crown, the Preakness Statkes and the Belmont Stakes, were won by horses Greek Money and Jaipur, respectively. Horse racing was big business, with New York state alone recording betting of more that half a billion dollars for the third straight year! No mention of races would be complete without covering automobile races, and there were many to cover in 1962. The Daytona 500, run about 80 miles south of the end of our trip at Jacksonville, Florida, was won by “Fireball” Roberts. Roberts drove a Pontiac, and Pontiacs won all three major stock-car races this year. In NASCAR racing, Joe Weatherly garnered his first Grand National title (later known as the Winston Cup Series and now the Sprint Cup Series). Joe won the title with one race to go for the season, over his closest competitor, Richard Petty. Roger Ward won the Indianapolis 500 on Memorial Day, even though favorite Parnelli Jones had set a new track record during the qualifying laps. Ward had been racing in the Indy since 1951 and this was his first win. The world Grand Prix racing title went to British driver Graham Hill when he won the African Grand Prix at the very end of the year, December 29. The American driver in the Grand Prix races had problems all season, as Ferrari, his car company, lost most of its top engineers. Drag racing was growing in popularity, with songs by the Beach Boys and others promoting the sport. The National Hot Rod Association (NHRA) had finally settled its Nationals event into Indianapolis in 1961, after many years of bouncing around the nation. Safety was becoming an issue and beginning on June 1, 1962, all cars competing in NHRA Stock Classes were required to have safety belts installed and used. There were literally dozens of other sanctioning organizations across the country, with varying rules for the cars, so claiming a national champion was impossible. Well, I’ve had enough speed for now, so maybe I’ll take a leisurely, 5-mile hike across the Mackinac Bridge back at the beginning point of our trip. Every Labor Day since 1958, the bridge is closed to vehicular traffic for this event. Take plenty of water, some sunscreen and a hat and I’ll see you after the walk to get back on US-23 for ROADTRIP-‘62 ™ .